Pitsouni E. et al. 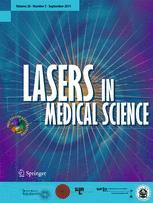 , Grigoriadis T., Falagas M., Tsiveleka A., Salvatore S., Athanasiou S. Lasers in Medical Science. 2017 Aug 2. doi: 10.1007/s10103-017-2293-8. Epub ahead of print.